Sufia (L) with her only child. Eight-year-old Badhan thinks his mother has been admitted to the Dhaka Medical College Hospital (DMCH) as she "does not have enough blood in her body." Little does the child from Kurigram know that his mother Sufia Khatun is fighting a relentless struggle with death, and a mere lack of blood is not enough to describe the disease she has been plagued with. Acute Leukaemia it is called and the other name for the disease is blood cancer. 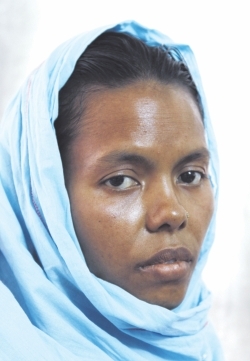 Two years ago, Sufia, now in her early thirties, had a severe bout of diarrhoea coupled with fever. A doctor was duly consulted and she was apparently cured. Since then, she has had several diseases–from jaundice to eclampsia. Six months ago, as she fainted in their house in Kurigram, Sufia was admitted to the local Sadar Hospital where the doctors suggested bone marrow and PBF tests. It was then that her husband took her to the DMCH. Sufia's husband Tofail Babul earns Tk 3,500 a month, which makes it difficult, impossible almost, to bear her medical expenses. To make matters worse, Babul's contract with his service provider expires in just two months. "I don't know what to do," he says, "I really don't know." Sufia grew up an orphan; she does not have the support– either financial or psychological–of a family. Only the medicine of a chemo cycle costs Tk 14,000, too expensive to bear for her husband. If you see her lie supine in bed 4X, Ward 308 at DMCH, a sense of guilt will envelope your heart– while we waste away hundreds of taka in buying things that we might never use, this young woman, so full of life, so indomitable in spirit, is embracing a slow and painful death only because she doesn't have the few lakh takas needed for her treatment.